For other uses, see Kiwi (disambiguation). Kiwi is the nickname used internationally for people from New Zealand, as well as being a relatively common self-reference. The name derives from the kiwi, a flightless bird, which is native to, and the national symbol of, New Zealand. 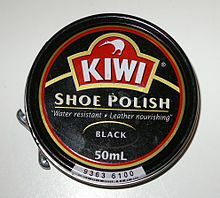 Unlike many demographic labels, its usage is not considered offensive; it is generally viewed as a symbol of pride and endearment for the people of New Zealand. The first New Zealanders to be widely known as Kiwis were the military. The Regimental Signs for all New Zealand regiments feature the kiwi, including those that fought in the Second Boer War, then with the Australian and New Zealand Army Corps in World War I. Much of the interaction between regiments and locals was done under the respective Regimental Sign, and the kiwi came to mean first the men of regiments and then all New Zealanders. Due to the relative isolation of New Zealand, many troops stayed in Europe (particularly at Beacon Hill, near Bulford on the Salisbury Plain, where they carved a chalk kiwi into the hill in 1918) for months or years until transport home could be arranged. In the early 1900s New Zealanders - including Soldiers and the All Blacks - were referred to as En Zed(der)s, Fernleaves, or Maorilanders. This usage was still in place near the end of World War I. During the First World War, New Zealand soldiers were often described as Diggers or Pig Islanders. But by 1917 they were also being called Kiwis. The kiwi had appeared on military badges since the South Canterbury Battalion used it in 1886, and it was taken up by several regiments in the First World War. The Oxford English Dictionary gives the first use of the 'Kiwi' to mean 'New Zealander' in 1918, in the New Zealand Expeditionary Force Chronicles. 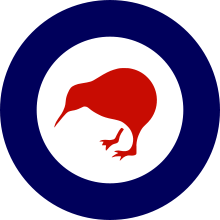 The nickname 'Kiwis' for New Zealand servicemen eventually became common usage in all war theatres. However, the Australian National Dictionary also gives the first use of the term 'Kiwi Kids' and 'Kiwis' in 1917, to mean Australian army recruits who had kiwied up; in other words, they had highly polished boots. This usage is now obsolete. The first official use of the term by a New Zealand sports team was by the New Zealand Rugby League team on its 1938 Tour of Australia, though the term had been colloquially applied to this team for some time. Following World War II the term was gradually attributed to all New Zealanders and today, throughout the world they are referred to as Kiwis, as well as often referring to themselves that way. Spelling of the word Kiwi, when used to describe the people, is often capitalised, and takes the plural form Kiwis. The bird's name is spelt with a lower-case k and, being a word of Māori origin, normally stays as kiwi when pluralised. Thus, two Kiwis refers to two people, whereas two kiwi refers to two birds. This linguistic nicety is well exemplified by the BNZ Save the Kiwi Conservation Trust, which uses the slogan "Kiwis saving kiwi". Kiwifruit, fruit associated with New Zealand, but not native to it, which is also known as the "Chinese Gooseberry"
^ "Kiwis/Kiwi - New Zealand Immigration Service (Summary of Terms)". Glossary.immigration.govt.nz. Retrieved 2012-09-13. ^ "Kiwi - A kiwi country: 1930s–2000s - Te Ara Encyclopedia of New Zealand". Teara.govt.nz. 2011-05-24. Retrieved 2012-09-13. ^ "The White Horses". Wiltshire-web.co.uk. Retrieved 2012-09-13. ^ Phillips, Jock (July 2012). "Kiwi - Kiwi and people: early history". Te Ara - the Encyclopedia of New Zealand. ^ Phillips, Jock (March 2009). "The New Zealanders - Maorilanders". Te Ara - the Encyclopedia of New Zealand. Retrieved 27 February 2011. ^ "Auckland Star - 27 February 1919 - Page 4". March 2009. Retrieved 4 January 2013. ^ ed. Bill Ramson (2008). "Australian National Dictionary". Oxford University Press Australia & New Zealand. ^ Ramson, Bill (1993). Of Pavlova, Poetry, and Paradigms. Victoria University Press. This page was last modified on 12 July 2014 at 01:46.